Canon's TR8520 All-In-One Printer is designed to meet all your needs from printing, copying, faxing and scanning at ease. With built-in FAX and a 20 SHEET ADF the PIXMA TR8520 is ready for multiple jobs like printing assignments, documents, reports, family photos, concert tickets, faxing, and scanning. With this brilliant wireless multifunction conviniently print stunning photos from your smartphone, iPad and computer. 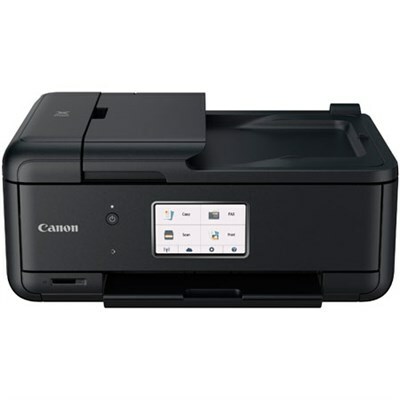 This compact printer from Canon fits perfectly anywhere in your home or office and is simple to operate with amazing features including the 4.3 inches LCD touchscreen. Further, enjoy printing hassle free from the Cloud, through Bluetooth and social media. Additional features includes a 5-Color Individual Ink System for detailed documents, memory card slot, front and rear paper feeding and convinient connectivity options to deliver outstanding results every time. The ultimate PIXMA TR8520 Wireless All-In-One printer is big on performance and handle all your home/office needs from printing, copying faxing and scanning, on the go! Find & select what you need with an intuitive 4.3 inches LCD user interface. With a 5 Individual ink system, only replace the ink that runs out. Print great looking 4 x 6 inches, 5 X 7 inches and even 5 x 5 inches square borderless photos. Get your company's name out there with the PIXMA TR8520 Wireless All-in-One Printer.